Genesis 14:2 that they made war with Bera, king of Sodom, and with Birsha, king of Gomorrah, Shinab, king of Admah, and Shemeber, king of Zeboiim, and the king of Bela (the same is Zoar). Genesis 14:3 All these joined together in the valley of Siddim (the same is the Salt Sea). Genesis 14:9 against Chedorlaomer king of Elam, and Tidal king of Goiim, and Amraphel king of Shinar, and Arioch king of Ellasar; four kings against the five. Genesis 14:10 Now the valley of Siddim was full of tar pits; and the kings of Sodom and Gomorrah fled, and they fell there, and those who remained fled to the hills. sid'-im, (`emeq ha-siddim; Septuagint he pharangx (or koilas) he haluke): The place mentioned in Genesis 14:3-8 as being the scene of encounter between Chedorlaomer and his allies with the kings of Sodom, Gomorrah, Admah, Zeboiim and Zoar. In 14:3 it is identified with the Salt Sea, and in 14:10 it is said to have been full of slime pits ("bitumen"). According to the traditional view, the Vale of Siddim was at the southern end of the Dead Sea. But in recent years a number of eminent authorities have maintained that it was at the northern end of the Dead Sea, in the vicinity of Jericho. Their argument has mainly been drawn from incidental references in the scene (Genesis 13:1-13) describing the parting of Lot and Abram, and again in the account of Moses' vision from Pisgah (Deuteronomy 34:3). In the account of Abram and Lot, it is said that from Bethel they saw "all the Plain of the Jordan, that it was well watered everywhere, before Yahweh destroyed Sodom and Gomorrah." The word here translated "plain" means "circle," and well describes the view which one has of the plain about Jericho from Bethel as he looks down the valley past Ai. But it seems to go beyond the text to assume that the Vale of Siddim was within that circle of vision, for it is said in Genesis 13:12 simply that Lot dwelt "in the cities of the Plain, and moved his tent as far as Sodom." In the vision of Moses, likewise, we have a very general and condensed description, in which it is said that he was shown "the Plain of the valley of Jericho, the city of palm-trees, unto Zoar," which, as we learn from Genesis 19:22, was not far from the Vale of Siddim. It is true that from the traditional site of Pisgah the south end of the Dead Sea could not be seen. But we are by no means sure that the traditional site of Pisgah is the true one, or that the import of this language should be restricted to the points which are actually within range of vision. The tendency at the present time is to return to the traditional view that the Vale of Siddim was at the south end of the Dead Sea. This is supported by the fact that Jebel Usdum, the salt mountain at the southwest corner of the Dead Sea, still bears the name of Sodom, Usdum being simply another form of the word. A still stronger argument, however, is drawn from the general topographical and geological conditions. In the first place, Zoar, to which Lot is said to have fled, was not far away. 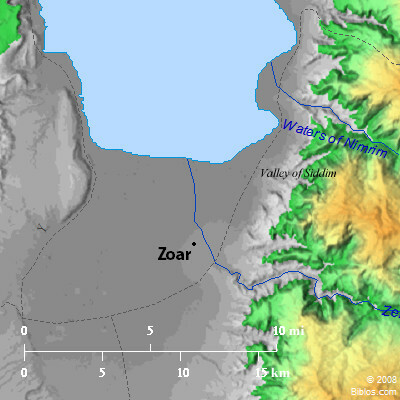 The most natural site for it is near the mouth of the Wady Kerak, which comes down from Moab into the southern end of the Dead Sea (see ZOAR); and this city was ever afterward spoken of as a Moabite city, which would not have been the case if it had been at the north end of the sea. It is notable in Joshua 13:15-21, where the cities given to Reuben are enumerated, that, though the slopes of Pisgah are mentioned, Zoar is not mentioned. In Genesis 14, where the battle between Amraphel and his allies with Sodom and the other cities of the plain is described, the south end of the Dead Sea comes in logical order in the progress of their campaign, and special mention is made of the slime or bitumen pits which occurred in the valley, and evidently played an important part in the outcome of the battle. At the south end of the Dead Sea there is an extensive circle or plain which is better supplied with water for irrigation than is the region about Jericho, and which, on the supposition of slight geological changes, may have been extremely fertile in ancient times; while there are many indications of such fertility in the ruins that have been described by travelers about the mouth of the Kerak and other localities nearby. The description, therefore, of the fertility of the region in the Vale of Siddim may well have applied to this region at the time of Lot's entrance into it. There are very persistent traditions that great topographical changes took place around the south end of the Dead Sea in connection with the destruction of Sodom and Gomorrah, while the opinion has been universally prevalent among the earlier historical writers that the site of Sodom and Gomorrah is beneath the waters of the Dead Sea. Geological investigations, so far from disproving these traditions, render them altogether possible and credible. There is a remarkable contrast between the depths of the north end of the Dead Sea and of the south end. Near the north end the depth descends to 1,300 ft., whereas for many miles out from the south end it is very shallow, so that at low water a ford exists, and is occasionally used, from the north end of the salt mountain across to el-Lisan. The precipitous salt cliffs of Jebel Usdum which border the southwest corner of the Dead Sea would indicate that, in comparatively recent times, there had been abrupt subsidence of a good many feet in the bottom of the Dead Sea at that end. Such subsidences of limited areas and in connection with earthquakes are by no means uncommon. In 1819 an area of 2,000 square miles about the delta of the Indus sank beneath the level of the sea, so that the tops of the houses were barely seen above the water. A smaller area in the delta of the Selenga River sank during the last century beneath the waters of Lake Baikal. Professor R.S. Tarr of Cornell University has recently described the effect of an earthquake on the shores of Alaska, in which there was a change of level of 47 ft.
More probably (see ARABAH; DEAD SEA) there has been a rise in the waters of the Dead Sea since Abraham's time, caused by the encroachment upon the original area of evaporation by the deltas which have been pushed into the main part of the depression by the Jordan, and various smaller streams descending from the highlands on either side. In consequence of these encroachments, the equilibrium between precipitation and evaporation could be maintained only by a rise in the water causing it to spread over the shallow shelf at the south end, thus covering a large part of the Vale of Siddim with the shoal water now found between el-Lisan and Jebel Usdum. SIDDIM, vale of, some place it on the s. of the Dead Sea, but others on the n. The meaning of Siddim is not certainly known. The location of this vale, or plain, depends upon that of Sodom and Gomorrah.